Completed March 2008, Agave Blue is a professionally decorated family-friendly luxury condominium that sits on the MEXICAN RIVIERA... 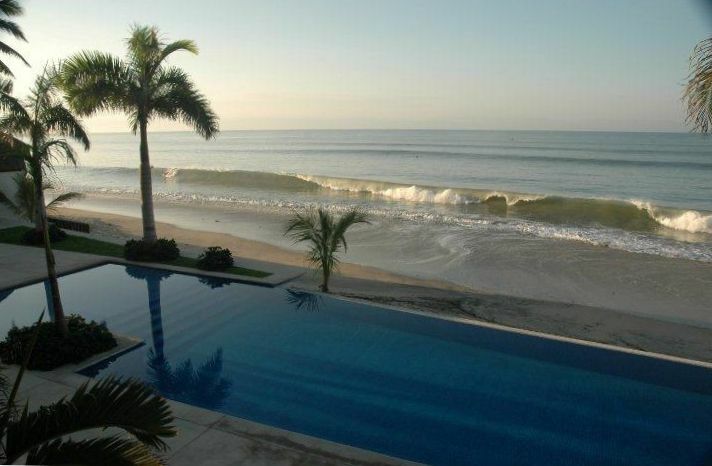 Located in an ocean front complex in Bucerias Mexico, the unit sits above a spectacular infinity pool and right on the beach of the Bay of Banderas. Listen to the waves crashing on the beach and watch the dolphins at play while you relax on your fully furnished private balcony. No expense was spared in this amazing vacation get away. The European kitchen is complete with top of the line appliances, granite slab countertop, & microwave oven. The bedrooms have king size beds with imported linens and designer bedding. The living room is spacious and comfortable and has complete entertainment system. There is an in unit safe, washer / dryer, beach towels, and water toys. Downstairs, there is a full size fitness room complete with equipment and a view to die for. There are marble floors throughout with floor to ceiling sliding doors that open up to your private balcony and overlooks the beach and ocean. Smell the salt air and watch the waves as you sip on a cool beverage. Life doesn't get much better than this. Quiet and quaint, Bucerias is a classic old Mexico town, complete with cobblestone streets and colorful architecture. Fabulous restaurants and shopping are a short stroll from your condo. If you're into walking, you can walk for miles in either direction on the perfect sands. Bucerias is also kid and teenager friendly. There are plenty of activities that your kids will enjoy such as swimming with the dolphins, zoos, beautiful beaches, zip lining, parasailing and more.The town center offers english speaking doctors, shopping, wonderful restaurants cooking some of the freshest seafood anywhere. The pace of life here is slow so relax and take in the culture, wonderful weather and laid back lifestyle. Anyone who knows Bucerias, loves it and keeps coming back. If you are into nightlife, Puerto Vallarta is a short drive away and offers some of the most vibrant nightlife anywhere. Ride horses on the beach, go zip treking in the nearby jungle, sight see, watch the kite sailing, or golf at one of the many world class golf courses, there is so much to do here. For additional fees, you can schedule an in unit massage from one of the best masseuses on the planet or make arrangements with our concierge service should you want the unit stocked with groceries and cold drinks upon your arrival. The goal is to make this vacation one of the most relaxing and memorable you have ever experienced. Let us pamper you in a way that you deserve by renting Agave Blue today! Thank you so much John & Joanne for letting us stay in your beautiful piece of paradise once again!! The sunsets and weather were amazing in Bucerias in March....we even saw the whales jumping several times during our stay. Going to sleep listening to the waves, swimming in the infinity pool and exploring the town was awesome!! We brought our friends to stay with us this time in the condo...they liked Bucerias so much, they were looking into possibly buying one themselves. Thanks again!! Traveling to Bucerious is fun in itself. Traveling to Bucerious and staying at the condominium of John and Joanne’s Letwenitz is bliss! This property is perfectly situated to allow for 24/7 ocean viewing and the infinity pool is right below the huge deck which is an oasis of beauty. The grounds are lovely. Staff is so helpful and you will be able to relax and enjoy each and every day to the fullest. The condo is well appointed and the layout is perfect for guests to have their privacy if required. Experience the difference by renting this property. You will want to return year after year as it is a wonderful place to vacation and close you the rest of the world if you like! What a joy to stay here. Thank you. This is our third stay and love it!!!! Location, View, Condo, Pool, Everything is perfect. Anything you need is right there!! Thanks again for sharing your piece of paradise!!! Everything was perfect. The condo was very comfortable and well maintained. We especially enjoyed relaxing on the large and well appointed terrace while watching distant whales, horseback riders and stunning sunsets. The location was excellent, we walked to everything. We never once needed to use air conditioning, the cool breezes, sound of the surf and very comfortable bed lulled us to sleep. We will be back. Great location (close to central). The unit has all the appropriate gadgets necessary in the kitchen (and sharp knives too!) Nicely decorated and top marks for cleanliness. Extra points for a comfy master bed! Would not hesitate to come back. A true gem in Bucerias! Bucerias is an amazing town. Lots to do and see and everyone is so friendly. The condo Agave Blue is well appointed, and the location cannot be beat. This property is unavailable from May 1 - Sept 30 yearly This property cannot be sub-let by tenant in lieu of cancellation.